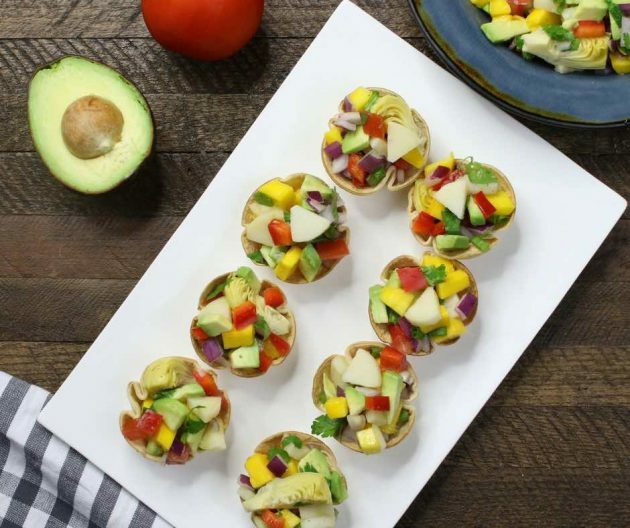 Heart of Palm Ceviche Cups are the perfect vegan appetizer featuring heart of palm, mango, bell pepper, artichoke, red onion and avocado in mini tortilla cups. 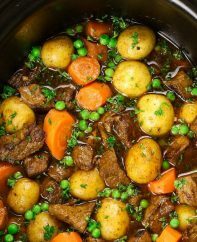 It’s ready in 15 minutes and perfect for your next party. Plus video tutorial! Friends summer may be winding down, but that doesn’t mean we’re finished with summer dishes! You know, the kind that’s perfect for sharing at backyard barbecues with friends. 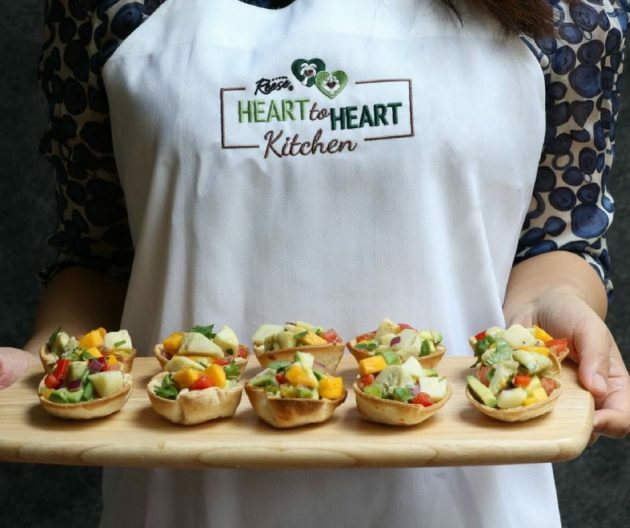 Reese Specialty Foods challenged us to create a sponsored recipe, so we created these heart of palm ceviche cups. It’s the perfect appetizer for entertaining, and it’s full of amazing colors and flavors! Plus, it’s got a nice crunch from the cup to contrast with the super nutritious vegan ceviche salad inside. There’s no doubt this is a great dish for summer, but guess what? We’ve put it out as an hors d’oeuvre at holiday parties and it was still the first to go. People love fresh food year-round! 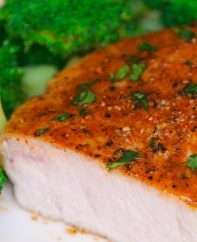 It’s one of our kitchen staples, and makes a great seafood substitute that’s much less expensive to boot. Reese is easy to find at Walmart and Shaw’s as well as many specialty shops. Hearts of palm make a great addition to salads like we’ve done here, and are also fun as an ingredient for pizza, tacos, and even casseroles. Grill masters will have fun grilling them too. Since heart of palm tastes similar to shrimp or scallops, a great life hack is using it as a seafood substitute as we’ve done here with this vegan ceviche recipe. Ceviche is the super popular dish found throughout the Caribbean and South America. It’s marinated in lime juice with onions, tomatoes and cilantro. 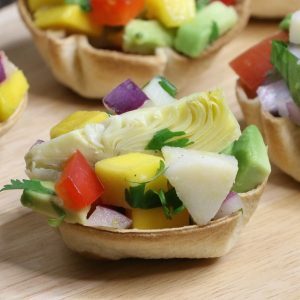 To dress it up a bit, we added in mango and avocado as well as Reese artichoke hearts, and then put it into cute homemade tortilla cups. So good! 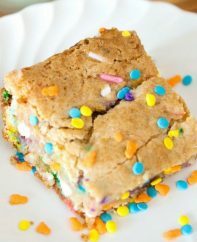 One of the awesome things about this recipe is you can make it in about 15 minutes. While the tortillas cups are in the oven, you can make the ceviche. Start by cutting circles out of some flour tortillas. You can use a circular cookie cutter or just the rim of a large glass. This is a great activity to do with kids. And that’s it – into the oven for 6-8 minutes until they brown at the edges. Meanwhile, you can make the ceviche salad filling. 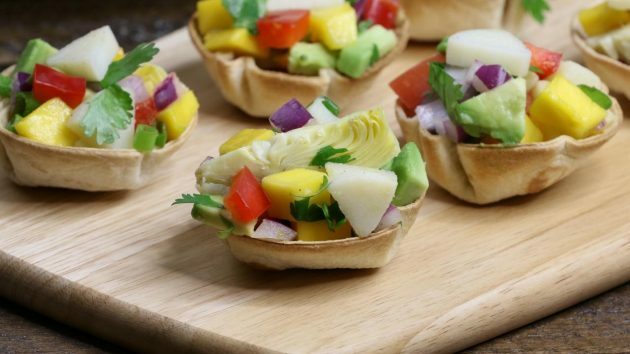 Once the tortilla cups are baked, the final step is simply spooning the ceviche filling into each cup. You can choose how much to put it, some people like them heaping, others not. You can make this recipe an hour or two ahead of the party. Just squeeze some fresh lime juice on top before serving to freshen them up. Enjoy! Preheat oven to 400°F and set aside two 12-cup muffin pans. Place tortillas on a work surface. 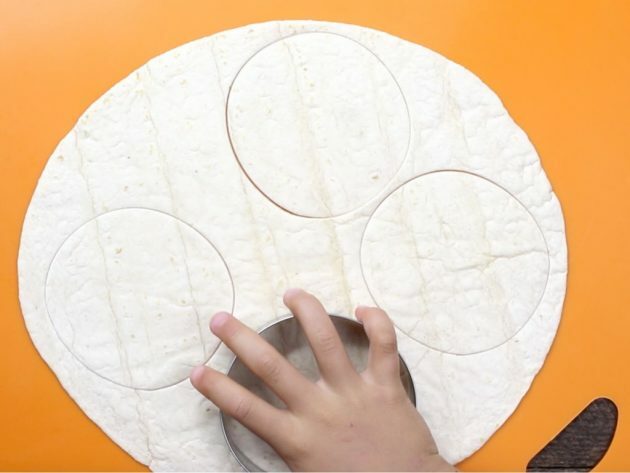 Using a circuar cookie cutter or a large drinking glass, cut 4 circles out of each tortilla. 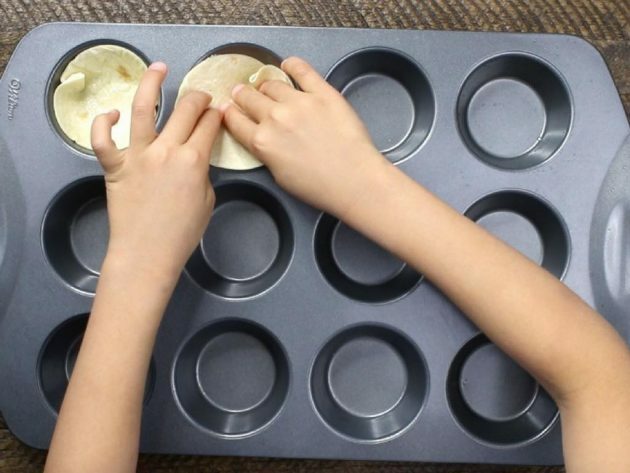 Bright each circle lightly with olive oil and place into a muffin pan cup. Bake for 6-8 minutes until the edges brown. Meanwhile, make the ingredients for the filling. 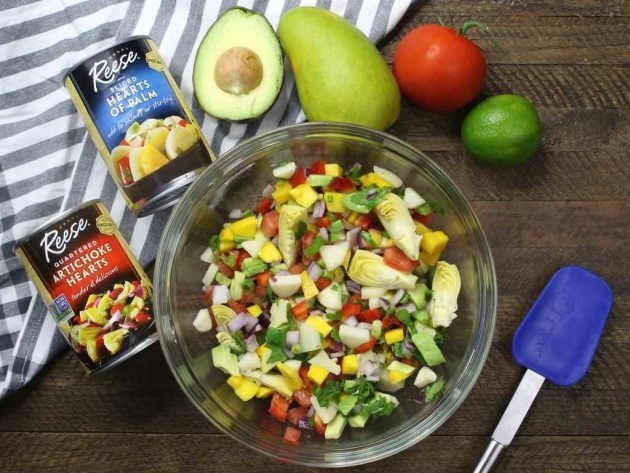 Peel and roughly chop the mango, avocado, red onion, tomato, red pepper, heart of palm, green onion and cilantro. In a medium bowl, add the chopped ingredients along with the artichoke hearts, salt, pepper and lime juice. Toss a few times to mix. When the cups are done, remove to a plate. Fill each cup with the ceviche mixture. Serve and enjoy! 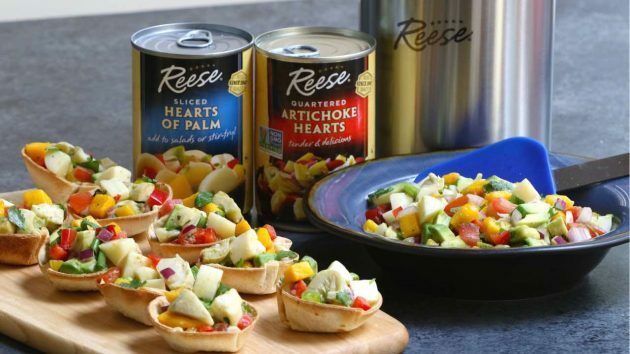 This is a sponsored post written by TipBuzz on behalf of Reese Specialty Foods.